I wrote “Drying Grass Moon” on a sleepy Sunday afternoon, which is when a lot of my writing seems to take place: sitting in bed with the kids playing upstairs and my wife napping beside me. Like many of my stories, it was based on a fragment I had sketched out in one of the voluminous free-write files that I try to keep regularly with varying degrees of success. The title itself, an old Native American (I think) designation of one of the full moons, had stuck in my mind. 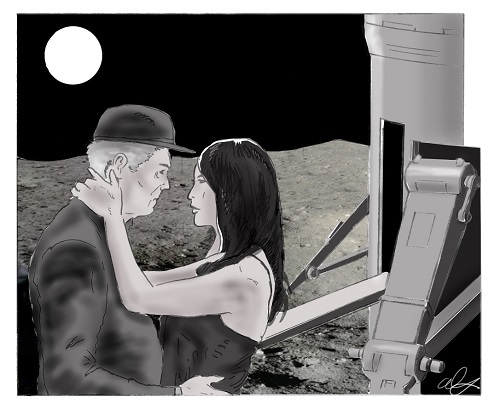 I wanted to play with that image, imagining settlement and abandonment on the lunar surface. One of the challenges was trying to write about the passage of time on the Moon, about what that would actually look like. The Moon is tidally locked with the Earth, so the Earth remains motionless in the lunar sky. Your location on the Moon determines the Earth’s position in your sky, and that position does not vary over the course of the month-long lunar day. The Earth would, however, go through phases in its fixed spot in the sky. I wanted those realities to be the background of the story, as well as the developing reality of exoplanetary discovery and how that might transform the way we view human expansion into our own planetary system. The twist in the story is about old age, youth, companionship, and– of course– sexbots. I’ll let you tell me whether or not you found it effective. Read “Drying Grass Moon” here. This entry was posted in Stories and tagged AE: Canadian Science Fiction Review, Drying Grass Moon, fiction, moon, science fiction, short stories, stories, writing on February 14, 2015 by boldsaintcroix.